Tonight the Chicago Bulls (20-52) welcome the Washington Wizards (30-41) to the West Side to play the third of a four-game regular season series. Chicago won the first matchup in DC, 101-92, but the Wizards bounced back the next time, 134-125, in Chicago. That game took place just three days after the teams completed a major trade in which Chicago acquired forward Otto Porter Jr., while DC landed fan-favorite Bobby Portis and Windy City native Jabbari Parker. Washington's Bradley Beal led all scorers that night with 31 points, while Parker and Portis stormed off the bench posting 20 and 10 points, respectively. Portis also grabbed a game-high 12 rebounds. Zach LaVine led the Bulls effort with 26 points, while Lauri Markkanen scored 20 and grabbed 11 rebounds. Despite having lost four of their last seven Washington hits the floor this evening clinging to faint playoff hopes, as they're 4.5 games behind the current No. 8 seed in the East, the Miami Heat (34-36). Miami takes on San Antonio, who has won 11 games in a row at home, in Alamo City tonight. Thus a Wizards win over the Bulls has the potential to pull DC within 3.5 games of making the playoffs with 10 left to play. The trade between the Bulls and Wizards has worked out well for both teams. Parker's numbers have jumped slightly, as he's increased his scoring, rebounding and shooting totals to 14.8 points, 7.4 rebounds and 56 FG% compared to 14.3, 6.2 and 47.4 FG% with the Bulls. Likewise, Portis' stats has also gone up as he's posting 14.6 points, 8.4 rebounds and shooting 46.7 FG% from the field with the Wizards compared to 14.1 points, 7.3 rebounds and 45 FG% with the Bulls. At the time of the trade Washington's won/loss record stood at 22-31 (.415). However since Parker and Portis have joined the team they've gone 8-10 (.444). Porter has also fared well in Chicago, averaging 17.5 points, shooting 48.3 FG% overall and 48.8 3FG% from deep with the Bulls. Unfortunately the 5th year forward from Georgetown is hoping heal up quickly from an injured shoulder suffered over the weekend. He's listed as doubtful for tonight's game. On Monday the Wizards were blown out at home by the Utah Jazz, 115-95. Parker came off the bench to lead the team in scoring with 19, while Beal added 15 and veteran forward Trevor Ariza chipped in a dozen. As a team, Washington shot just 42 percent from the field and went 8-for-27 (.296) from the 3-point line. Meanwhile the Bulls have been a similar rut of late as they've lost seven of their last nine. However they did snap a five-game losing streak Monday night on the road, 116-101, at Phoenix. Robin Lopez led the way with 24 points on 11-for-14 shooting, while Markkanen and LaVine each scored 17 and Kris Dunn chipped in with 14. As a team, the Bulls shot 51 percent from the field overall, despite going 4-for-16 (.250) from deep. In order for Chicago stay on a winning track and play the spoiler role this evening they need to show up energy and fire. The ball has to selflessly skip from player-to-player and from side-to-side, getting and keeping everyone involved in the flow of the game. The Bulls need to force Washington's defense on its heels by playing fast and relentlessly attacking the basket at every opportunity. 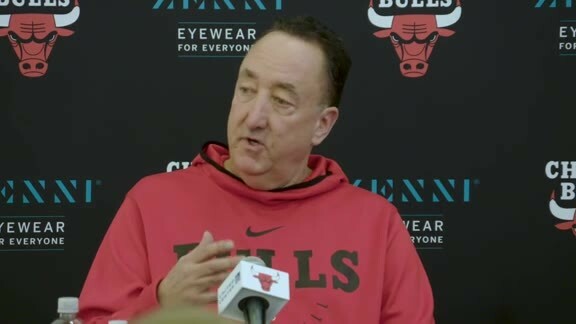 Collectively, the Bulls also must sport a gritty attitude and be physical, especially when it comes to taking control the paint and rebounding the ball off the backboards. Both offensively and defensively Chicago must step up and take charge, establishing a willingness to dictate a fast but also comfortable flow to the game. They have to take advantage of their speed and athleticism by getting out on the break early and often and score easy buckets before Washington's defense has time to set up and close down driving lanes to the hoop. Getting to know: Otto Porter Jr.